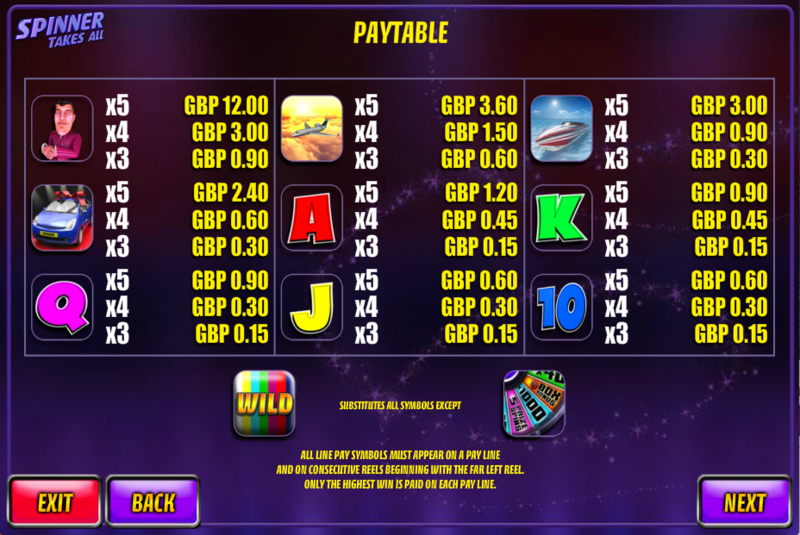 We’ve previously reviewed a number of online slots based on television game shows and unsurprisingly the quality has varied from one to the next; for that reason one more is always welcome and this time the developers at Games Warehouse have come up with the goods. Spinner Takes All offers the full television studio experience complete with clapping audience so read on for the full review. 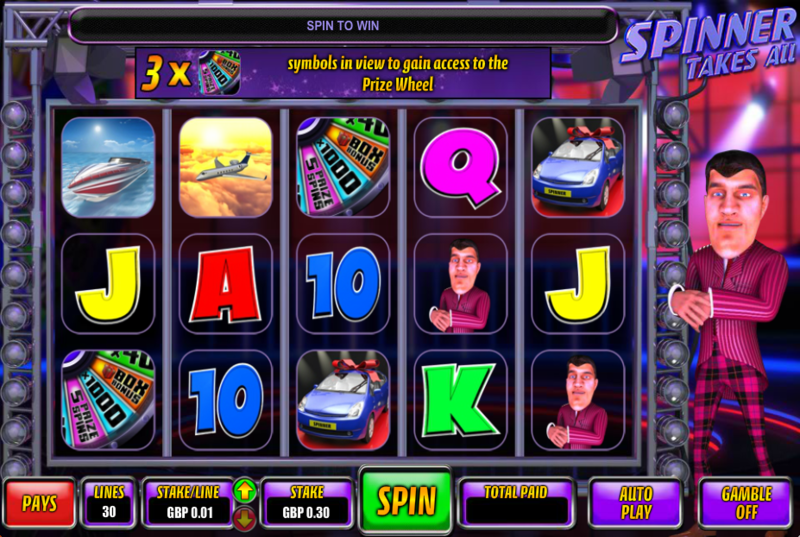 Spinner Takes All is a five reel slot with three rows and thirty fixed paylines; a large-chinned gameshow host reminiscent of a younger Bruce Forsyth oversees proceedings to the right of the reels which themselves spin on a lighting gantry. The four high value symbols are the gameshow host, an aeroplane, a speedboat and a new car; lower values are the standard 10, J, Q, K and A. The wild symbol is a represented by some rainbow colours and it substitutes for all others except the prize wheel scatter. Prize Spins – here you will receive five free spins on a new set of reels which includes an expanded wild on reel three for the duration. The round is over when the five spins are finished. Box Bonus – this is a three round affair and in each round you will be faced with a screen displaying 20 prize boxes; just pick the boxes to reveal a cash award, a star (which moves you to the next round) or a cheque book and pen (Blankety Blank?) which ends the round. Finding all three stars wins the star prize and ends the round. Prize Board – you will be taken to the Spinner Takes All 3 x 3 prize board and asked to pick squares until you find three matching prizes, three ‘X’s (which ends the round) or a star which takes you to the bonus board. Finding stars in the bonus board increases your win. Any base game win can be gambled and you will be taken to a screen displaying a spinning wheel with various playing cards making up the target segments. You can bet on a variety of outcomes at different odds depending on your risk aversion but a wrong choice means you lose it all. The maximum winnings here is £300,000. We enjoyed playing Spinner Takes All, it’s high quality, amusing and comes with a gameshow-tastic variety of bonus features which seem relatively easy to trigger. It comes with an RTP of 95.50%.